Samuel Alito was sworn in as the 110th justice of the U.S. Supreme Court on Tuesday, hours after he was confirmed by the Senate on a partisan vote. Chief Justice John Roberts administered the oath in a private ceremony at the Supreme Court building across from the Capitol at about 12:40 p.m., EDT, court officials said. Alito was expected to join Roberts and the rest of the Supreme Court justices at tonight's State of the Union address. Alito will be sworn in a second time at a White House ceremony Wednesday. The final Senate vote was 58-42, with all but one of the Senate's majority Republicans voting for Alito's confirmation, and all but four of the Democrats voting against him. CBS News correspondent Gloria Borger reported that sticking to party lines is going to stay the norm. In a meeting today with top congressional Democrats, Borger reports they expressed a desire to work with Republicans, but said it would be impossible in the current Washington climate, which House Democratic Leader Nancy Pelosi described as one of "corruption, incompetence and cronyism." That is the smallest number of senators in the president's opposing party to support a Supreme Court justice in modern history. Chief Justice John Roberts got 22 Democratic votes last year. Justice Clarence Thomas, who was confirmed in 1991 on a 52-48 vote, got 11 Democratic votes. Alito watched the confirmation vote on television at the White House. CBS News correspondent Mark Knoller reports that a cheer went up in the Roosevelt Room as the tally was announced confirming Alito. President Bush led in the applause as he and Alito watched the roll call vote together. 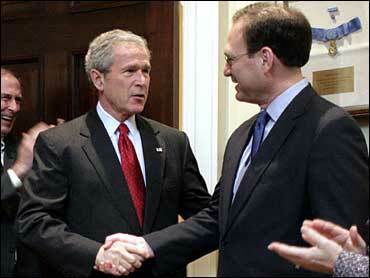 Mr. Bush shook Alito's hand and told him "now go to work." In a written statement, Mr. Bush said he was "pleased" with the Senate vote, and he again described Alito as "a brilliant and fair-minded judge who strictly interprets the Constitution and laws and does not legislate from the bench." Senate confirmation of Alito is a major political victory for the president in a midterm election year, CBS News correspondent Peter Maer reports. The political timing is good for Republicans because the addition of Alito to the high court will help the president appeal to core conservatives who turn out in off-year elections. Alito is a longtime federal appeals judge, having been confirmed by the Senate by unanimous consent on the 3rd U.S. Circuit Court of Appeals in Philadelphia on April 27, 1990. Before that, he worked as New Jersey's U.S. attorney and as a lawyer in the Justice Department for the Reagan administration. Alito replaces Sandra Day O'Connor, the court's first female justice and a key moderate swing vote on issues such as assisted suicide, campaign finance law, the death penalty, affirmative action and abortion. Barak Obama, a Democratic senator from Illinois, told CBS News that he had no doubt Alito is going to be more conservative than O'Connor. "I hope that Judge Alito recognizes that he's got a role that's unique in America, where Supreme Court justices with lifetime appointments can change the landscape for this country and not subject to democratic checks," Obama said. "Hopefully he'll exercise his job with great and sober judgment." Critics who mounted a fierce campaign against his nomination noted that while he worked in the solicitor general's office for President Reagan, he suggested that the Justice Department should try to chip away at abortion rights rather than mount an all-out assault. He also wrote in a 1985 job application for another Reagan administration post that he was proud of his work helping the government argue that "the Constitution does not protect a right to an abortion." Now, Alito says, he has great respect for Roe as a precedent but refused to commit to upholding it in the future. "I would approach the question with an open mind and I would listen to the arguments that were made," he told senators at his confirmation hearing earlier this month. Democrats weren't convinced, with liberals unsuccessfully trying to rally support to filibuster Alito on Monday. "The 1985 document amounted to Judge Alito's pledge of allegiance to a conservative, radical Republican ideology," Senate Democratic leader Harry Reid of Nevada said before the vote. They also repeatedly questioned Alito at his five-day confirmation hearing after he would not discuss his opinions about abortion or other contentious topics. At one point, his wife, Martha-Ann, started crying and left the hearing room as her husband's supporters defended him from the Democratic questioning. "To Judge Alito, I say you deserve a seat on the Supreme Court," said Senate Majority Leader Bill Frist, R-Tenn.
Alito's path to the Supreme Court is infused with New Jersey connections. Born in Trenton as the son of an Italian immigrant, he attended Princeton University. He headed to Connecticut to receive his law degree, graduating from Yale University in 1975. His late father, Samuel Alito Sr., was the director of New Jersey's Office of Legislative Services from 1952 to 1984. Alito's sister, Rosemary, is a top employment lawyer in New Jersey. Alito was not the White House's first choice — or even second choice — for the Supreme Court. Mr. Bush picked Roberts when O'Connor first announced she was stepping down last year. After Roberts was promoted to the top spot after Chief Justice William Rehnquist died, the White House against passed over Alito for the vacant seat, instead selecting White House counsel Harriet Miers. Miers' withdrawal following a barrage of conservative criticism in late October finally brought Alito's name to the forefront, although he then had to contend with constant references as "Scalito" or "Scalia-lite," references to his judicial similarity to Justice Antonin Scalia. "I'm my own person. And I'm not like any other justice on the Supreme Court now or anybody else who served on the Supreme Court in the past," Alito said at his confirmation hearing.